HAO Herbal Hair Shampoo is a plant based cleansing foam for hair and scalp. This is a prefect cleansing shampoo effectively remove excessive sebum as well as a scalp care shampoo with moisturizing effects. 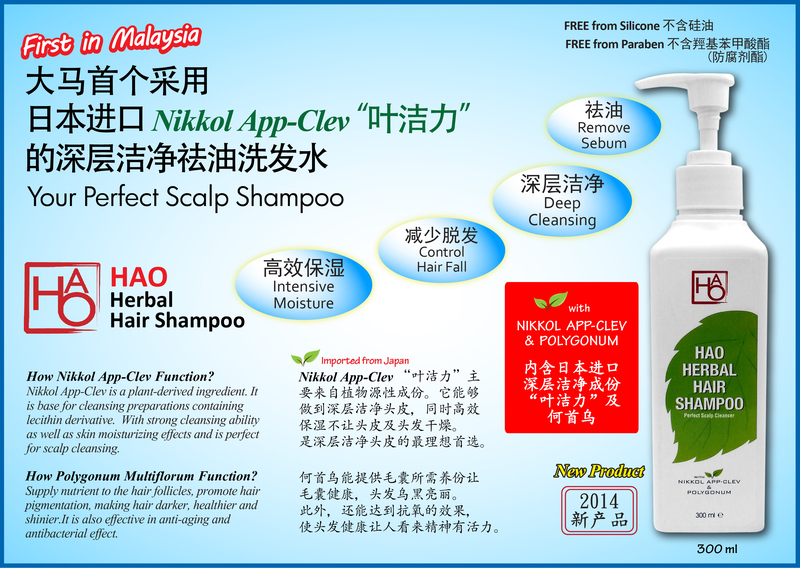 Nikkol App Clev is a plant-derived ingredient. It is base for cleansing preparations containing lecithin derivative. With strong cleansing ability as well as skin moisturizing effects and is perfect for scalp cleansing. Supply nutrient to the hair follicles, promote hair pigmentation, making hair darker, healthier and shinier.It is also effective in anti-aging and antibacterial effect. Pump appropriate amount of HAO Herbal Hair Shampoo onto the palm, add water rub until bubbling. Put onto wet hair wash and clean as usual and gently massage the scalp. Rinse with water.